It's time for city governments, regional planning agencies, planning commission members, environmentalists, and other "good government" groups and activists to start discussing seriously the likely relationships between driverless cars and sprawl, which we discuss on our site as a dispersed development pattern beyond what is needed to accommodate population growth. Those who haven't thought much about driverless cars, or autonomous vehicles as professionals would be more likely to say, might need to begin with our article on driverless cars and city planning. 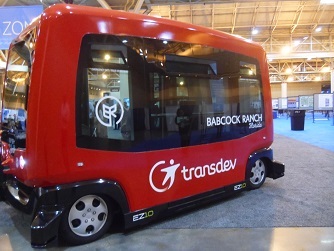 But for those who have been watching the more rapid than expected development of autonomous vehicles, we can begin to speculate about how this coming transportation revolution will impact our development pattern. As you might guess, the probable impacts may vary, depending on exactly how the technology evolves and how governments owning roads and streets respond. As is typical in community development, some results are likely to cancel out other effects too. This is why scholars and prognosticators of all types differ in their assessment. We want to start with good things that may happen when autonomous cars start to become more prevalent. The major impact may be that fewer parking lots and garages will be needed in the heart of cities and towns. In this prediction we are banking on the idea that many, even most, driverless cars deployed will not be privately owned, but instead will be owned by public transit agencies or by ride hailing businesses such as Uber. If so, it will mean that in time there will be fewer vehicles in cities and towns overall, and that each vehicle will spend much more time on the road, on average, than is the case now. Take a moment to absorb that if you haven't thought about it before. Parking lots and garages are dead space in terms of pedestrian interest, human interaction, and beauty. Worse, sometimes they offer convenient homes for crime, and the hard surfaces aggravate water quality and water runoff issues. This lesser need to public parking lots and garages will be especially potent in business districts, as well as convention and tourism oriented areas. The parking that is needed can be accommodated on the periphery of the district in less prime real estate, since the vehicle will be able to respond to a rider-generated signal that it needs to drive itself to a pick-up point. Incidentally, if driverless cars develop in the way we're predicting, on-street parking will be replaced by pick-up and drop-off parking, at least in the heaviest traffic areas. Some on-street parking also may be eliminated, leaving space for new public art, public green space, outdoor cafe seating, and more. Especially if parking lanes are removed in favor of green space, positive water quality, pedestrian interest, and business opportunities may be experienced. So if parking lots and garages that now dominate most of our downtowns are able to be replaced with buildings or public open spaces such as pedestrian plazas, gardens, and rain gardens, we will be at once enhancing the quality of urban design, vibrancy and excitement of a business district, support for entrepreneurs and culture in the form of more accidental meetings, market for small businesses and restaurants, and economy and efficiency of providing public services as activity is concentrated in a smaller area. Redevelopment will provide many temporary construction job opportunities and ultimately more permanent employment can result as businesses occupy the newly created spaces. We also believe in the potential for reduced crime as there are more "eyes on the street." Another benefit to city centers will be reductions in air pollution as a result of the likely rapid transition to electric cars that will come with driverless vehicle fleet ownership. These add up to many potential positive community development benefits as a result of a fleet of autonomous passenger vehicles making a significant change in current driving patterns. To bring this discussion back to driverless cars and sprawl, consider that this enhanced urban vitality that we described in the previous paragraph is exactly what makes people willing and eager to live in the city center or nearby. This housing preference clearly bolsters a dense and intense development pattern as opposed to large lot and exurban residential patterns. That's all good for community development in the broadest sense of the term. On the other hand, it seems to us that when people can be transported to work, school, or play hands-free, the length of their commute to and from work may become close to irrelevant for many. They can use that time to catch up on texts and e-mails, read, snooze, spend quality time with the spouse, put on make-up, eat breakfast, have a cocktail, or engage in any of a number of pleasant activities. The assumed increase in safety, traffic speed due to the ability of future vehicles to control traffic signals to permit optimal traffic flow, and traffic predictability because of the ability to form a convoy also will figure into the equation as people calculate the costs and benefits of a longer commute. Now you can see that the truly autonomous vehicle could make it quite easy for residential development to spread even further from employment centers. Further, since we don't expect rural roads to have the infrastructure to support the most advanced features of autonomous vehicles for many years, we think that any residential sprawl induced by driverless cars will hug the major roads. This is particularly true because we think that in the early years of the transition between owner-operated cars and driverless fleet cars, we expect that the autonomous vehicles will be allowed only in designated traffic lanes. We already have seen that this linear growth pattern, as opposed to a neighborhood or district development pattern, is the recipe for suburban sprawl. In speculating about remedies for this major negative consequence of widespread adoption of driverless passenger vehicles, we think that the possible aggravation of urban sprawl can only be addressed at the metropolitan level. It will require political will to act together at a regional level in the long-term interests of the region. And that political will is in short supply in many, if not most, regions of the U.S. It also will require a level of cooperation between transportation planning and land use planning that has rarely been seen in the last 50 years. Other countries may have a stronger and more positive history of regional cooperation, but those too will be tested as driverless cars become more and more common. Of course the high degree of cooperation required for implementation of driverless car lanes and practices across a metropolitan area may nudge regions into action mode even more aggressively than the perceived need to support private cars did in the 20th and early 21st century. One can only hope that this accelerated transportation coordination will spill over into a discussion of the effects of sprawl and its huge negative drag on the vitality and viability of city centers. We have written about driverless cars and sprawl more extensively on the linked page.